Harper Jones has been a freelance writer since 2007. Her work has appeared in "Zink! Fashion Magazine," "emPower Magazine" and the "Washington Post." She has also published several health and fitness e-books and a book of short stories. Jones graduated with a Bachelor of Arts in English and health sciences and currently works as a yoga teacher. Saliva keeps microbe colonies in check. Without adequate amounts of saliva, microbes that cause gum disease can colonize the mouth, contributing to receding gum lines. 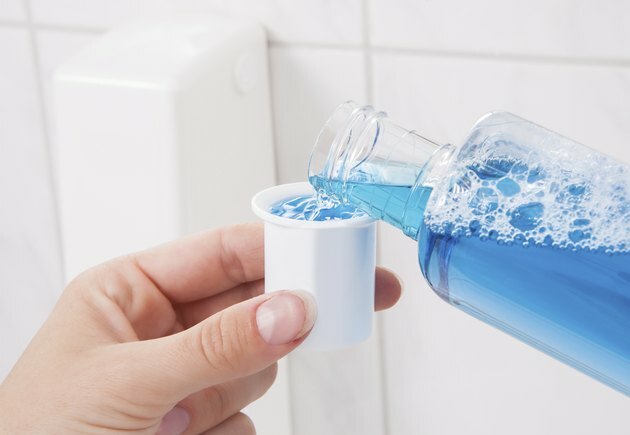 Mouthwashes that contain harsh chemicals such as sodium lauryl sulfate or alcohol contribute to a decrease in the amount of saliva your produce. Therefore, natural or organic mouthwashes are desirable. Receding gums are not always due to gum disease. If you notice that your gums are receding, first try brushing your teeth more gently for two to three weeks. A large percentage of individuals with receding gumlines report that their gums regenerate after they begin to brush their teeth more lightly. If your gums are still receding, purchase a natural mouthwash. Pair your mouthwash with natural toothpaste, as many types of toothpaste contain substances that decrease the amount of saliva you produce, as well. Many health and natural food stores carry natural mouthwashes. Regular grocery stores may stock a few types of natural dental care items as well. If all else fails, online vendors such as Amazon.com carry natural dental care items. Tom’s of Maine, Jason Natural and Tea Tree Therapy are common brands available in health and natural food stores and online. Natural mouthwashes are not expensive, although they do cost more than regular mouthwash. Natural mouthwashes range in price from $3 to $6 for 24 oz. Keep in mind that if you choose to order from an online retailer, you may be responsible for paying associated shipping and handling fees. What Are the Benefits of Neem Toothpaste? Why Do My Gums Hurt When I Exercise?